Looking for new earrings? How about a splendid pair of white pearl earrings? We know how you’re constantly looking for special earrings to compliment your outfits, earrings that enable you to wear them the next years as well. We’ve recently added new pearl earring designs to our collection of pearl earrings. You can check the new arrivals here. But before you do that, let us show you 5 pairs of white pearl earrings that will instantly win your heart! Perfectly described as “Class for class”, our New Arrivals collection wants to surprise you with fine new earring designs. Our intention was to keep the timeless beauty of pearls while incorporating it into contemporary designs, perfect for every taste. As you will see, we take pride in our designs because they are representative for almost any personality the wearer may have. As a result, because we want to offer you the most current products in pearl fashion, we elaborated new and extremely affordable sterling silver pearl earrings. Our newest pearl earrings designs are remarkably refined, ideal for women of all ages. Many designer earrings stand out, and our designs make no exception! Secondly, when choosing the right pair of earrings, we know you’re taking into account your own personal style and your type of complexion, so we also gave you some useful suggestions on how to wear these new silver pearl earrings. These earring designs come with a black pearl version as well, but for now let’s focus on the white pearl models. You know that feeling when you enter into a room and you feel like a star because of all the attention that you get? Well, that’s the kind of feeling this pair of white pearl earrings promises to deliver you once you have them on! Feel like a star and shine bright like a star with the Pearl Earring Pair in Star White. Fabulous, exquisite and outstanding! The single clear crystal stone pops up the glam vibe and gives the right amount of sparkle. And look at those flawless pearls! Ideal for: these new earrings are perfect as bridesmaids’ gifts, or for your daughter on her prom night. They are ideal night events, Christmas gifts. How to wear them: you have endless options, starting from an elegant black dress (strapless or with spaghetti straps) to an office look that needs more animation and class. Moreover, they are perfect for both daily and night events. WOW! Now those are the modern pearl earrings that you’re missing from your jewelry collection. This should be fixed, right? 😊 The bold geometric design can spice up any conservative look. The freshwater pearl tangle earrings have been reinvented! If you have a round face, then this pair of pearl earrings with triangles is ideal for you because it will create the appearance of an elongated face. The playful design will definitely help you create an irresistible look. And don’t be afraid to experiment! Ideal for: this pair is appropriate for all ages, as a birthday gift or wedding anniversary gift. How to wear them: wear them with dresses for a night out, your hair up and a pair of classy heels. You can even wear them with a silk blouse and culottes or office suit pants. Combine cute, elegant, discrete, gracious and you get this wonderful Pair of Lolly White Pearl Earrings. Any lady who loves button style pearl drop earrings will fall for this new earring design. Decorated with a round clear crystal stone, these pearls are doing justice to your own beauty. What’s more is that you have unlimited options when it comes to your attire. They look fantastic with any outfit. Ideal for: they are appropriate for all ages and skin complexions. Can be offered as a graduation present, birthday or any kind of anniversary gift. How to wear them: you can wear this pair of white pear earrings with flirty dresses, skirts or casual tops with jeans. Plus, they would look great if you wear your hair in a bun. Would you resist to this pair of sterling silver pearl earrings? 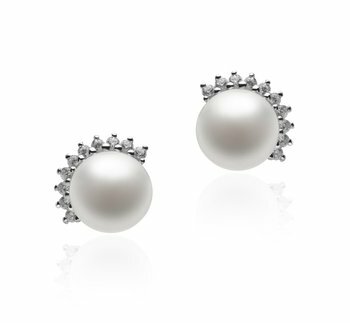 They are ideal for ladies who love pearl jewels, looking for a modern touch to the classical type of stud pearl earrings. Very Grace Kelly like, this pair of white pearl earrings will bring you endless compliments. Stand out with this tasteful earring design! Ideal for: they are the perfect finish touch for wedding receptions, parties, any kind of anniversaries and ceremonies. How to wear them: wear them with a black blazer and a white shirt or with a classic midi-dress. Absolutely lovely, right? This pair of white pearl earrings has dreamy and charming features that will make you adore them on the spot. The fact that these white lustrous pearl earrings are actually hanging suspended from tiny silver puffed hearts is what makes them so playful, pretty and eye-catchy in the same time. Ideal for: this pair would be entirely suitable for your daughter, little sister, or as a gift for your niece. These pearl earrings are the perfect choice for a first pearl jewelry piece for young ladies. How you can wear them: you can wear this Pearl Earring Pair in Heart White with lively, bouncy dresses, off the shoulder tops. This trendy earring design is so versatile that you can even wear it with other heart shaped items. For example, with a cute little bag. So, this was our top 5 new white pearl earring designs, which hopefully charmed you well enough to make you want to wear them. We would be more than happy to help you pick the best pair of white pearl earrings for you or that special person, so please, don’t hesitate to contact us or use the Pearl Wizard. Don’t think these are the only white pearl earrings available from our new collection. We recommend checking the other new arrivals as well. As we previously mentioned, each new earring design has an equally beautiful black pearl version. You might want to discover them too before your final purchase. We warmly recommend our pearl earrings, because you will find uniqueness and versatility in every single pair. This entry was posted in PearlsOnly Blog and tagged pearl earrings, white pearls by PearlsOnly Team. Bookmark the permalink.